It’s a sweet smoosh of a name with a country twang. Thanks to Katie for suggesting a name she’s considering for her baby-on-the-way! 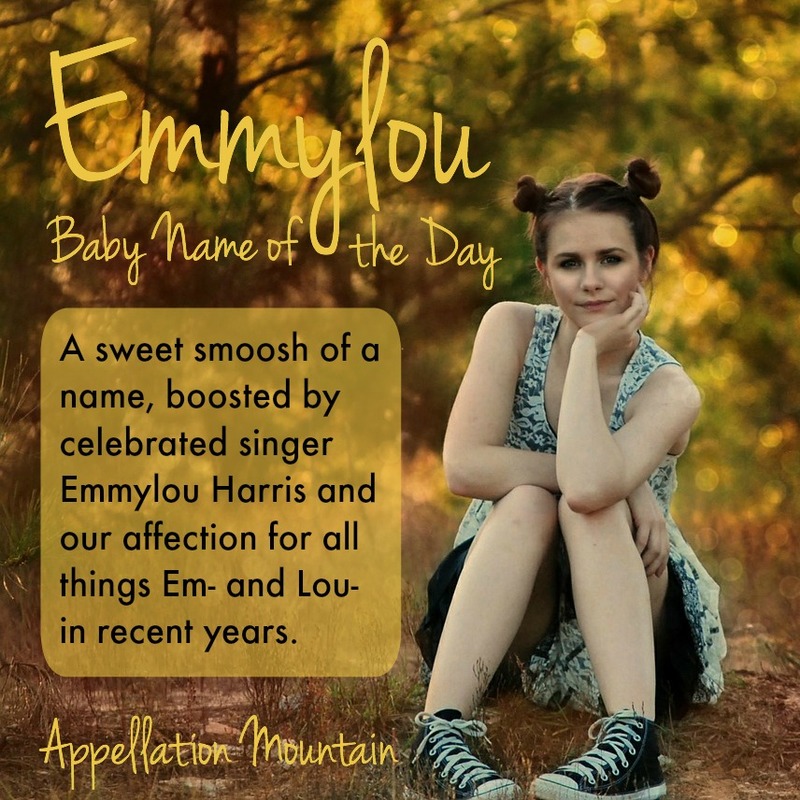 Our Baby Name of the Day is Emmylou. It’s been a good few years for Em- names. Emma and Emily have both held the #1 spot in the US in recent years, and both were still in the Top Ten as of 2013. They’ve brought Em- surnames (Emery and Emerson), less common forms of classic names (Emilia, Emilie), smooshes (Emmalyn, Emmalee), and novelties (Ember) along for the ride. Lou is just starting her rise. 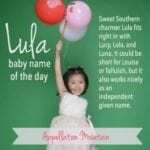 It’s the short and simple name chosen by Heidi Klum for her youngest daughter, Lou Sulola. Names like Lucy, Luna, Lucia, and Lucille are trending for girls, while Luke, Lucas, and Luca are solidly established for their brothers. Formal names for Lulu range from the expected (Louisa) to the out-there (Ludovica). In other words, while Emmylou is a rarity, her constituent parts are well-established. At any moment, you could meet a girl with an Em- name or a Lou- name. No surprise that sometimes they’re smooshed together. Girls have been named Emmylou in small numbers for years. Then along came singer-songwriter Emmylou Harris. (Yes, it’s her real name.) She’s racked up 13 Grammys since the 1970s. Harris has an eclectic style – a little bluegrass, a little folk. She was part of the O Brother, Where Art Thou? 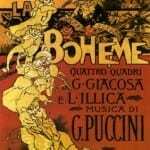 soundtrack and has collaborated with a who’s who of modern music, including Gram Parsons and Bob Dylan. She toured with Elvis Costello in the early 2000s. But somehow, she’s not quite a household name. Despite that, it’s clear that her first name has inspired plenty of parents over the years. The first time five or more girls were given the name Emmylou was 1924. The second time was 1978. I kept thinking about what Ms. Harris brings to her given name, and I think it’s this: integrity. Annie Kate is just as sweet, but Emmylou has a built-in role model, one with creative courage. Most years since 1978, a handful of girls have received the name. 2013’s 52 Emmylous marked a new high. Ms. Harris certainly deserves some credit. Her long career has established her as incredible talent. And let’s face it – if she were going to implode, Miley Cyrus-style, those days are probably in the past. (Miley fell 46 places to #387 in 2013. And Ms. Cyrus’ antics haven’t been any less controversial since – oh, the perils of borrowing a name from a young pop star!) Instead, Emmylou feels venerable – a grand dame of the craft. Our affection for Em- and Lou- names doesn’t hurt, either. Smoosh names have always had the potential to catch on. Annabelle is the current darling, but there’s always room for more. 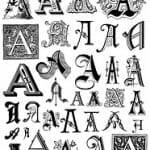 But here’s the factor that matters most, I think: we are less and less attached to formal names, and more inclined to put the name we prefer for daily use right on the birth certificate. Of course, if you find Emmylou a touch too sweet, there’s always the possibility of using it as a nickname for Emma Louise, Emily Lucille, or any other name combination with the right sounds, from the familiar to the daring. Emmeline Ludovica, anyone? If you’re looking for a name that’s slightly Southern, creative but not reckless, and straddles the stands-out/fits-in divide, Emmylou might be one to consider. I LOVE MY NAME “EMMYLOU” named after Emmylou Harris of course! I’m not a fan of this name at all. With the nickname-y Emmy, the Lou on a girl, and the smoosh of them together — it’s very much a “hick” name to my ears. I’m the Katie that asked for this name to be featured. My husband and I got the name from George Strait’s song “Check Yes or No.” We’re pretty big George Strait fans. I would say that Emmylou is my husband’s top name. My top name he won’t agree to, Adele. I’ve liked that name since I saw “The Majestic” with Jim Carrey, long before the singer showed up, and I don’t even listen to current pop tunes. Anyhow, I would say my top two after Adele are Tessa (Tess) and Emmylou. I also like Adeline/Adelina but don’t really care for Madeline/Madison/Madelyn which are SO similar; nor do I like Addy/Addie and therefore Maddie. there will be so many Maddies and I don’t know if being called Addy/Addie can be avoided. I’m just not sure how I’d feel about that. I HATED being Katie L. growing up and always swore I would never name my children something so common. If I find a name I like and it’s under the top 50, it’s out. I would like to call her Leinie (line-ee) for short. I don’t like how Adeline sounds like Add-a-line. I do like the barbershop quartet song Sweet Adeline. Also, Adalida is a George Strait song that I always thought was Adelina, which is why I’m partial to that name too. I’m totally listening to the Vance Joy song that Nancy mentioned, which I had never heard before, nor had I heard of the artist, and now I’m crying. haha! It’s very sweet. The middle name would be Mae, which is my middle name and was my grandmother’s name who passed away while my dad was young. Mae is technically also on the list as a name. I kind of like Tessa Mae more than Emmylou Mae but I like the connection Emmylou had to my favorite music artist and the fact that my husband and I came up with it together. Mae is for certain though unless we name her Mae or June (also on the list) so if I like Tessa Mae more, and Mae is for certain it makes me think we should go with Tessa but I don’t know yet. Those would be two really cute sisters’ names. Haha! I’m pregnant with our first child, and it’s a girl. This comment was crazy rambling, sorry. Katie, thanks for sharing! I know what you mean about wanting a name that isn’t too popular. I think I do stumble on “Emmylou Mae” because it could be “Emmie Loumae” or “Emmy Lou Mae” and so on. But when a middle name has that much meaning, I think it’s worth it! Just two thoughts (neither criticisms, just observations)- since you seem to be bothered by common names, you should know (from the firsthand perspective of an Emily called Emmy exclusively most of my life due to there being multiple Emilys in the family), that the long popularity of Emily and Emma means there are a LOT of Emmys covering a wide range of ages out there. I love it as a name, but it is *extremely* popular in common use if not as a birth certificate name. Gotta differentiate between all those Emilys and Emmas somehow. She might be the only Emmylou she ever meats, but she’ll likely meet a lot of Emilys called Emmy. And also that Leinie is the common name of a brand of beer (Leinenkugel) that is very, very popular in the midwest, and spreading in availability. If you google “Leinie”, the entire first page of results are beer-related. Her nickname would definitely be remarked on if, say, she grows up and wants to go to the University of Wisconsin. Then again, if you go with Leinie, she’ll never have a problem finding personalized items! I’m an Emma Louise whose name was inspired by, though not given for, Emmylou Harris. Personally, I’m glad my parents did not actually name me Emmylou, which I find too cutesy. What do you think of Emmaline/Emmeline? Growing up, I loved having a familiar but uncommon name (my own criteria used when I named my daughter Louisa), so I understand why you don’t want to go with anything too popular. I’d say something like Emmaline (or Emmeline) also straddles the line of being recognized but underused, and it would give you the nicknames of both Emmy and Leinie. Plus, I think Emmeline is a name that would grow well with a girl/woman; it doesn’t read as too juvenile or too mature. Folks currently choosing Emmylou may have been inspired by that pretty Vance Joy song “Emmylou.” I think the album it’s on was released in 2013. I would probably go with Emma Louise and use Emmylou as the nickname. 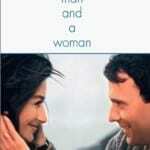 It’s a lovely combination either way, and I love Emmylou Harris! Or Emilia Lucille! Yes, that’s what I would use.